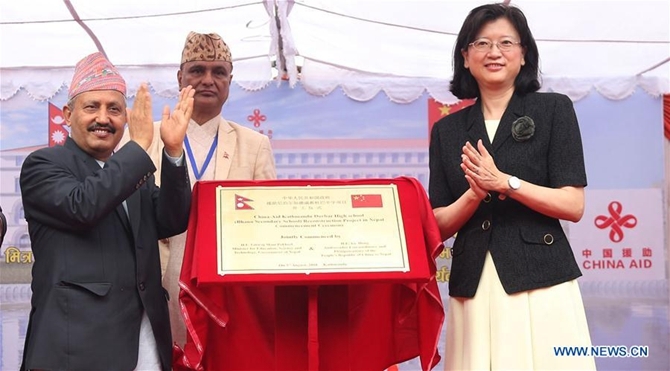 The reconstruction of Nepal's oldest modern school -- Bhanu Secondary School, which was severely damaged by the massive 2015 earthquake, has begun with Chinese assistance. Nepali Minister for Education, Science and Technology Giriraj Mani Pokhrel and Chinese Ambassador Yu Hong jointly launched reconstruction of the historic building at Ranipokhari in the capital Kathmandu on Friday. The building of the school, widely known as Durbar High School, is one of the 25 quake-damaged projects that China has agreed to help reconstruct. The school, established in 1853, was shifted to the current location in 1891. After a 7.8-magnitude earthquake hit the Himalayan country in 2015, the Nepali government had made an arrangement to teach the students at make-shift shelters within the school premises. The students have been taking their classes at a nearby public college over the past month after the school building was demolished for reconstruction. Before the devastating quake, the building was housing two schools -- Durbar High School and Sanskrit Secondary School with around 500 students, according to the school administrations. Bhisma Raj Khatri, who came to study at Durbar High School this year from the eastern hilly district of Panchthar, had to study at the make-shift shelter before being shifted to the college building. "I am thrilled that I would be able to study at the modern building to be constructed soon," Khatri told Xinhua. Since the quake damaged the Durbar High School building, the students have difficulties in finding adequate space for accommodation. Shankar K.C, a tenth-grader at Sanskrit Secondary School, recalled the days when they used to squabble for space at the make-shift buildings. China's Shanghai Construction Group has been contracted to reconstruct the building within the next 20 months. Chinese Ambassador Yu said China would build a safe and attractive building blended with traditional features, and expressed the hope that it would remain as a symbol of friendly relations between the two countries.